Here (Ram, Abhay), (Mohan, Abhay), (Sohan, Abhay),(Ram, Rahul), (Mohan, Rahul), (Sohan, Rahul) is showing student and teacher relations. any subset of A*B is relation from A to B.
R⊆A*B so R is relation from A to B. Here R represent the relation (is less then). (1, 5)∈R means 1 is less then 5. every subset of A*B denotes same relation. 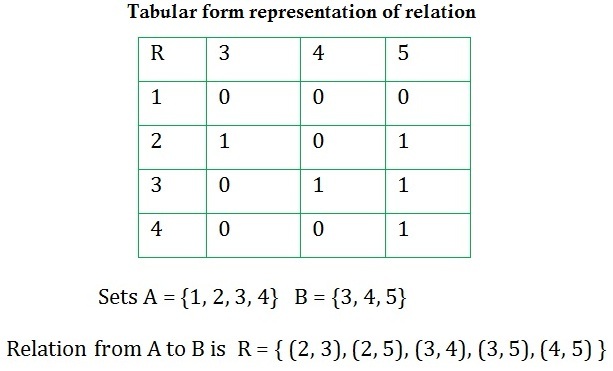 Relation from set A to set B can be represented through five different forms. Set-builder form Representation of a Relation in set-builder form Representation relation is describe through some rule or property like one component is greater then another component (greater then relation between component ). 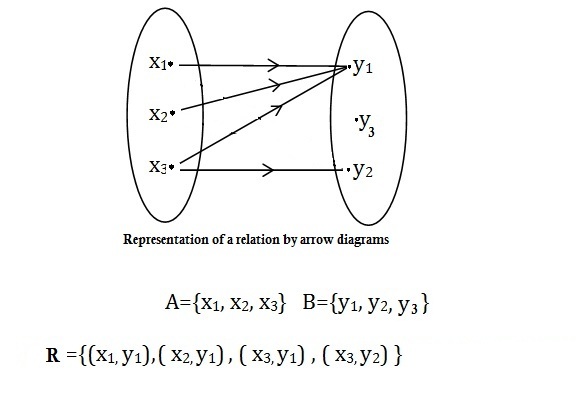 Domain of a Relation :If any relation from set A to set B is R then domain of relation R is defined as collection of all distinct element of relation where a ∈ A such that (a, b)∈ R for some b∈B. in other word domain of any relation is set of first component of all the ordered pairs belonging to R. domain of any relation R is written as Dom (R). 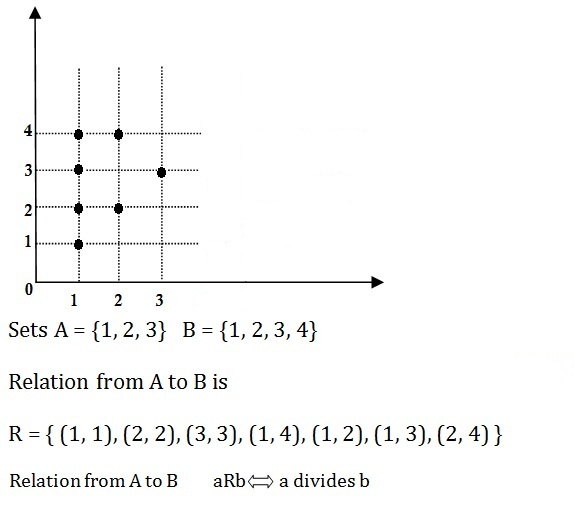 Range of a Relation : If any relation from set A to set B is R then range of relation R is defined as collection of all distinct element of relation set where b ∈ B. in other word range of any relation is set of second component of all the ordered pairs belonging to R.
Co-domain of a Relation : if R is any relation from A to B then B is known as co-domain of relation R.
Total number of relations between two sets is defined as 2(number of element in first set * number of element in second set). if we have two non-empty finite sets A and B and number of element in first set is p and number of element in second set is q then total number of relation will be 2p*q.
if any relation from set A to set B (R ⊆ A*B) is subset of A*B then inverse relation from set A to set B is denoted by R-1 is relation from set B to set A.